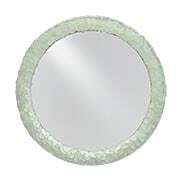 The Abalone Decorative Wall-Mount Mirror is striking presence wherever is resides. Hundreds of iridescent shells adorn the frame giving it a luxurious appeal. This elegant design is a great way to reflect light, open up a space, and enhance your decor! 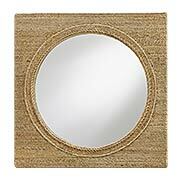 The Beachwood Square Mirror brings outdoor flair into your home. 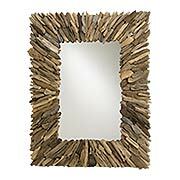 Beautifully crafted in natural driftwood, it evokes an earthy tone and feel. Use this handsome design to brighten and energize a room, open up a space, or enhance your decor. Luxury by the seaside is at the heart and soul of the Margate Wall-Mount Mirror. Natural oyster shells adorn its appealing contemporary gold-leaf finished frame, bringing sophistication to any coastal-inspired interior. What a fashionable way to brighten any space, whether the dining room, foyer, or bath. 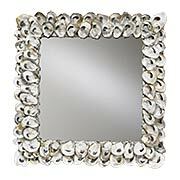 With real oyster shells embellishing its diminutive square frame, the Oyster Shell Mirror brings the ocean to any setting. Lovely and versatile, you can display it on its own, in groups, or use it as a tray. What a fashionable way to brighten any space, whether the dining room, foyer, or bath. 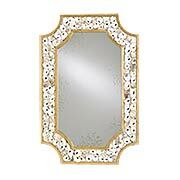 The Eos Wall-Mount Mirror is a modern accent influenced by classic elements. 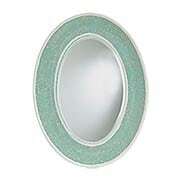 This mosaic design features Aqua glass pieces surrounding a timeless oval frame. A traditional technique is modernized with current materials and finishes to create a beautiful transitional piece. 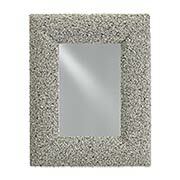 The Arista Wall-Mount Mirror is a natural beauty. Made of wood, the frame is covered in beautiful shades of tumbled sea glass, giving it a frosted appearance. Use this eye-catching look to brighten and energize a room, open up a space, or enhance your decor. The Batad Shell Wall-Mount Mirror feels right at home in sea-inspired interiors. Made of wood, the frame is covered in sun-dial shaped, pearlized shells. Use this eye-catching look to brighten and energize a room, open up a space, or enhance your decor. Comes complete with metal cleats and can be hung vertically or horizontally. The Tisbury Wall-Mount Mirror brings a layer of texture to your decor while fitting in with almost any color scheme. This natural-colored design is formed from multiple layers of abaca rope. A nautical piece, it feels right at home in sea-inspired interiors. These heavy-duty caster cups are an attractive and understated way to protect your carpet from damage by furniture feet. 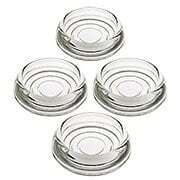 Made of durable cast glass with a shallow cup, they are strong enough for large and heavy furniture pieces. 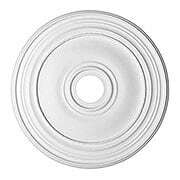 Each set contains four 2 9/16" diameter caster cups, enough for one sofa, cabinet or table. These heavy-duty caster cups are an attractive and understated way to protect your carpet from damage by furniture feet. Made of durable cast glass with a shallow cup, they are strong enough for large and heavy furniture pieces. 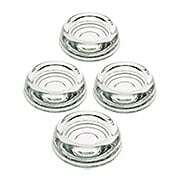 Each set contains four 3" diameter caster cups, enough for one sofa, cabinet or table.